We hope you will plan to attend the April MARP meeting being held in Michigan Central’s 1878 Freighthouse, now the focal point of Ypsilanti’s historic Depot Town. If it has been awhile since your last visit, you will be impressed with the work of the Friends group that recently completed a successful crowdfunding effort to continue their vision of creating a vibrant community meeting place. Our featured speaker, Liz Treutel, is eager to help guide us through the implications for Michigan’s transportation system – including passenger trains — of Proposal 1 on the May 5 ballot. As a policy associate at the Michigan Environmental Council, Liz is providing invaluable and enthusiastic leadership to the Michigan By Rail project which has undertaken a study to gage the feasibility of returning passenger train service to the Coast-to-Coast route connecting Detroit-Lansing-Grand Rapids-Holland. A native of Wisconsin, Liz has adopted Michigan as her new home among the Great Lakes. Armed with degrees in architectural studies and urban planning, as well as work experience with SMART, she is passionate about increasing accessibility and opportunity through transportation policy and linking transportation to sustainable land use, economic development and placemaking. If you would like to connect with a carpool to the meeting, please email marprail@yahoo.com. The 10th Annual Michigan Earth Day Fest in Rochester takes place on April 24-26, not May 24-26. 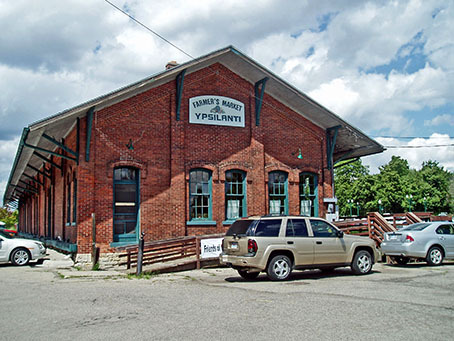 MARP member Ren Farley has posted an interesting account (with photos) of Ypsilanti history and the Michigan Central depot and freight house.